Trans Iskandar Route BET4 is a Johor Bahru local bus service operated by Sri Maju, plying between JB Sentral and Masai via Stulang Laut, Bayu Puteri / Sri Stulang, Permas Jaya, Plentong and Seri Alam. 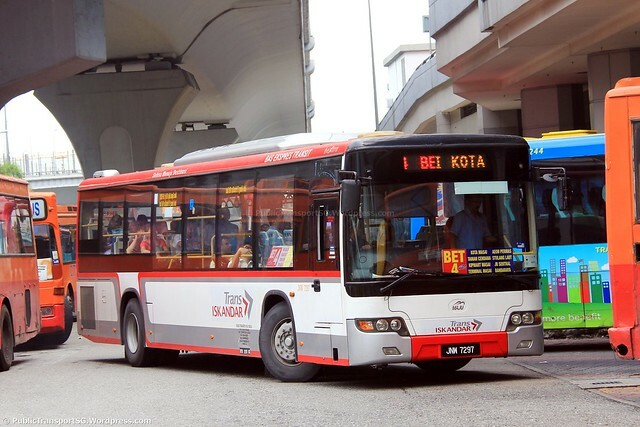 Trans Iskandar Route BET4 connects Johor Bahru City Centre (JB Sentral) with the town of Masai, via Stulang Laut, Bayu Puteri / Sri Stulang, Permas Jaya, Plentong and Seri Alam. The route between JB Sentral and Masai is also served by Causeway Link 9B and City Bus 39 & 133, which operate at higher frequencies but take a longer route via Pandan City and Taman Saujana. Originally conceived as a bus rapid transit system, Trans Iskandar bus services are local and semi-express bus routes serving the greater Iskandar Malaysia region. Known as Bas Ekspres Transit in Malay, this gives rise to their common prefix: BET or BeXTRA. BET4 commonly utilizes Hino AK and Higer KLQ6128G buses.